A-Rod Celebrates His 40th Birthday With What Else….An A-Bomb From A-Rod!! DaveTalksSports: What do you want for your birthday this year Alex Rodriguez? Alex: I don’t know Dave. I feel like I have everything I’ve ever wanted. DaveTalksSports: How about another home run? You don’t have enough of those yet. DaveTalksSports: Oh wait, have you been a good boy? DaveTalksSports: Oh who am I kidding?! It doesn’t matter! You’re playing so well you are completely overshadowing all the mean, nasty, hurtful, despicable, dishonest, and deceitful things you’ve done, and you’ll probably get exactly what you want anyway. Alex Rodriguez turned 40 years old yesterday. In honor of himself, he hit his 678th career home run in a 6-2 victory over his former team; The Texas Rangers. A-Rod is now hitting .276 on the season with 24 home runs and 59 runs batted in. He has WILDLY exceeded everyone’s expectations this year (possibly even his own), and after serving a 162-game suspension last season, A-Rod has returned completely rejuvenated. Being the New York Yankees’ primary DH has helped A-Rod solely focus on hitting, as he has only played 6 games in the field (4 at 3B and 2 at 1B). It has also allowed him to stay healthy while playing in 91 of the Yankees’ 98 games this season. As with anything attached to Alex Rodriguez’s name there is always suspicion. Is his success this season tainted or has he found the fountain of youth in a back alley somewhere in The Bronx? No matter what your opinion of A-Rod, we must admit his season has been spectacular, and he is one of the biggest reasons the Yankees stand atop the American League East. After A-Rod’s hot week of home run hitting (hitting 5 home runs in as many days), the ‘Live In The Moment’ question of the day is: Will A-Rod pass Barry Bonds and how many home runs will he end his career with (so what if that’s 2 questions)? All I can do is laugh. 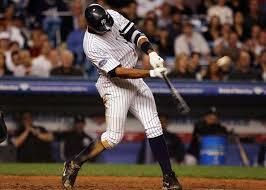 As much as A-Rod enjoys shoving his success in the face of his doubters, father time waits for no man. I’ll simplify it: Today, A-Rod has 678 hr’s and would need 85 more to pass Bonds. Even at an ultra-gernerous pace of 20 hr’s per year, A-Rod would need to RE-SIGN ANOTHER CONTRACT after his age 41 season of 2017 (when he’ll turn 42), and then continue this torrid pace. I’m sorry to disappoint all you dreamers out there, but enjoy A-Rod while he’s still dropping ‘A-Bombs’ because before you know it he’ll only be dropping Informant Tips on his PED Supplier. What do you think? Is A-Rod’s success this season natural? Or is he back on the juice? Me: So Alex, do tell….where does your new found inner strength really come from? Are you juicing again or have you found the fountain of youth to propel you to this new level of success this year? Alex: Well, to be honest (with) “Me”, I can’t really tell you. Me: So what you’re saying then, it’s a mystery to you how you’ve been able, at the age of 40, to consistently progress to the point of already having 24 Homeruns and 59 RBI’s. Come you can share. Alex: Well, Me, again I have all praise given to the man upstairs. So if by some miracle, he has forgiven my “evil ways” then that’s all I can say. Me: Gee, thanks A-H_L _, I mean A-Rod, Thanks for once again being you! So all you true sports fans out there who want realism and truth. You may have to seek it elsewhere. I don’t think A_ _ _ _ would know it if it was pitched straight at his head by John Lester and “smacked his wittle head.” I tought I saw a puddy tat. I did. I did. GO Sox. Even if they are in the toilet. And GO Pats even if Tomy Boy is out for the count…. of 1 – 2- -3 -4….oh wait he’s back in the game!!!! Yeah…….